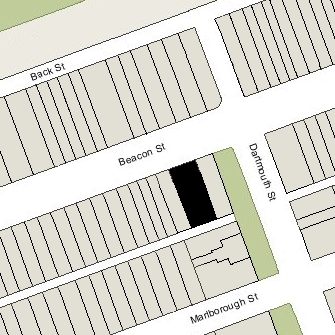 259 Beacon is located on the south side of Beacon, between Dartmouth and Exeter, with 330 Dartmouth to the east and 261 Beacon to the west. 259 Beacon was designed by Blaikie and Blaikie, architects, and built in 1889-1890, for mason and builder Peter Graffam, one of three contiguous apartment buildings (330 Dartmouth, 259 Beacon, and 261 Beacon). He and his wife, Alice S. (Tufts) Graffam, lived in Malden. 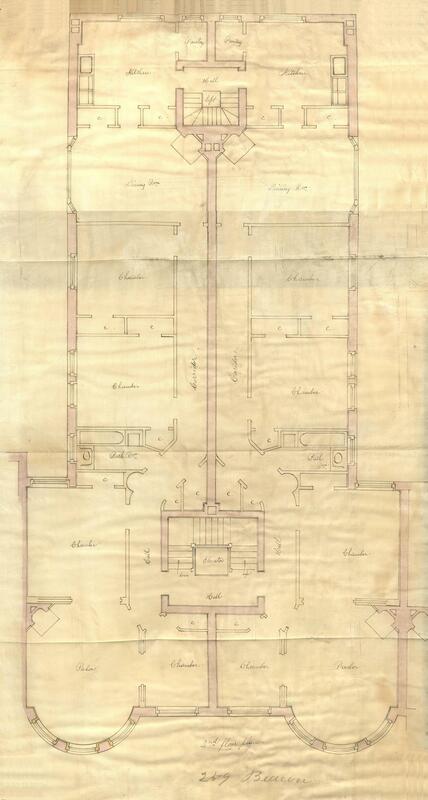 Peter Graffam is shown as the owner of 259 Beacon and 261 Beacon on the on the original building permit applications, dated December 13, 1888, and on the final building inspection reports dated December 30, 1889. 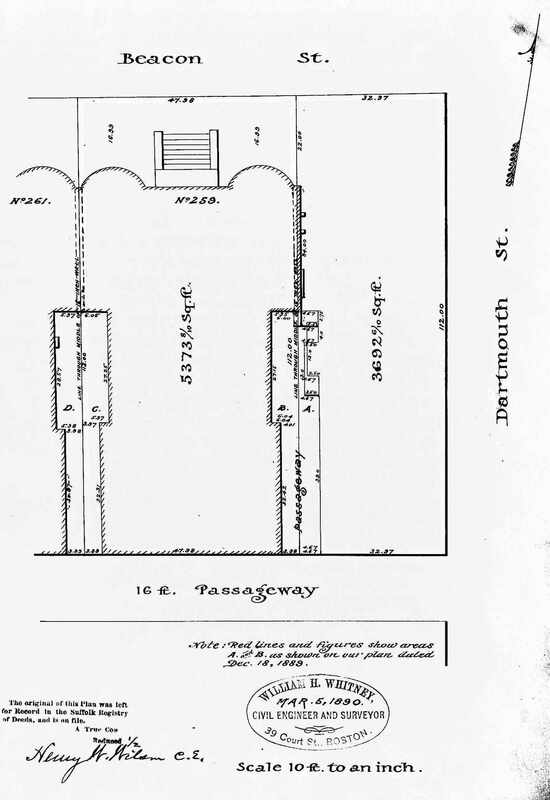 He is also shown as the owner of 330 Dartmouth on the final building inspection report, dated December 16, 1890 (the original permit application has not been located). 259-261 Beacon were known as The Grosvenor and 330 Dartmouth was known as The Graffam. Over the years, the three buildings changed hands frequently, sometimes being held by one owner and sometimes being held by different owners. All three were converted into condominiums: 330 Dartmouth in 1979, 259 Beacon in 1984, and 261 Beacon in 1983. Click here for an index to the deeds for 259 Beacon. On December 31, 1889, 259 Beacon was purchased from Peter Graffam by attorney Linus Mason Child. On the same day, he transferred the property to William H. Richmond, a real estate dealer from Providence. Although he had sold the property, Linus Child and his wife, Ada (Abbie) M. (Cummings) Wilson Child, lived in one of the apartments at 259 Beacon during the 1889-1890 winter season. They had married in November of 1889 and it probably was their first home together. He previously had lived at 425 Beacon. In April of 1890, he purchased 261 Beacon from Peter Graffam, and then sold it six months later. By the 1890-1891 winter season, the Childs were living in an apartment at 330 Dartmouth. William H. Richmond probably purchased 259 Beacon on behalf of Dr. Richard Charles Flower, who acquired the property from him on September 29, 1890. Richard Flower was the proprietor of the Flower Hotel on Columbus Avenue, where William Richmond was living temporarily when he purchased 259 Beacon. Dr. Flower and his wife, Mayde M. (Manfull) Flower, lived at 316 Commonwealth. 259 Beacon subsequently changed hands and on June 10, 1891, was acquired by Samuel Little, president of the National Rockland Bank. He and his wife, Elizabeth (Malbon) Little, lived in Roxbury. In April, he had acquired 330 Dartmouth. The properties changed hands and in May of 1924 were sold to three separate owners. They all changed hands again, with 259 Beacon and 261 Beacon acquired by real estate dealer James M. Burr. By December of 1924, all three properties were owned by real estate dealer George F. Welch. On December 10, 1926, they were acquired from him by real estate dealer William J. Stober. 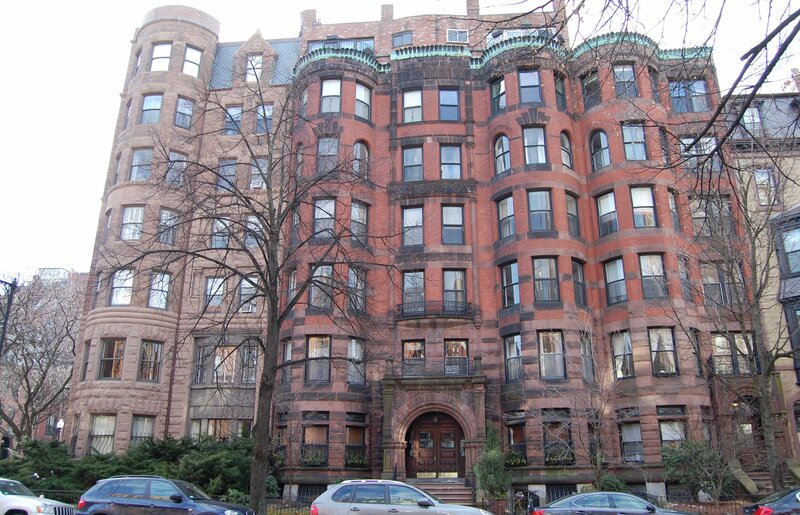 William J. Stober retained 330 Dartmouth and sold 259 Beacon and 261 Beacon on December 23, 1926, to Anna Teresa (Connors) Demara, the wife of Napoleon L. Demara. They lived in Lawrence, where he was a theatre owner. 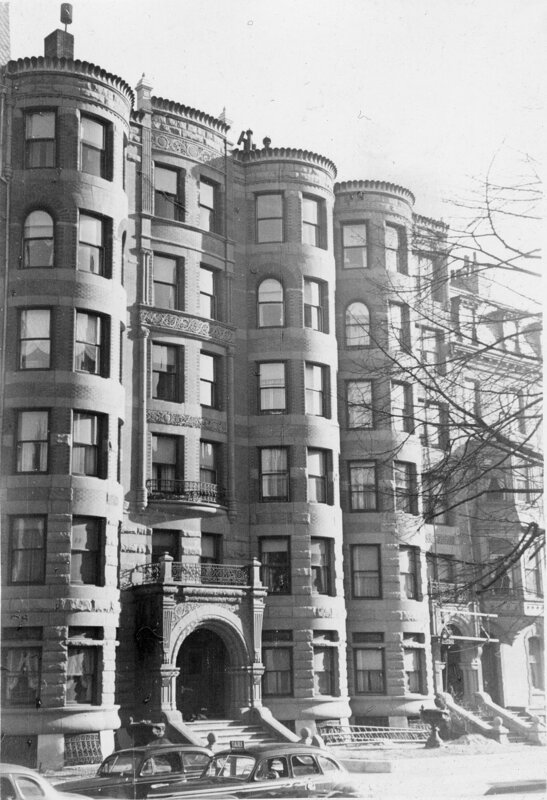 On June 3, 1936, the Boston Penny Savings Bank foreclosed on its mortgage on 259 Beacon to the George F. Welch Trust, which had been assumed by the Demaras, and took possession of the property. In August of 1936, the Milford Savings Bank foreclosed on its mortgage on 261 Beacon to James M. Burr, also assumed by the Demaras, and took possession of that property. 259 Beacon and 261 Beacon remained under separate ownership from that time. The Boston Penny Savings Bank continued to own 259 Beacon until October of 1941. It subsequently changed hands, remaining an apartment building. On January 18, 1950, 259 Beacon was purchased by Salvatore Pizzi and his wife, Maria (De Benedictis) Pizzi, of Belmont. He was a barber. In January of 1951, Salvatore Pizzi filed for (and subsequently received) permission to remodel the building and increase the number of units from 12 to 18. In July of 1954, he filed for (and subsequently received) permission to remodel the building again, and increase the number of units to 24. By 1966, the number of units had been further increased to 28. In May of 1966, Salvatore Pizzi filed for (and subsequently received) permission to add a seventh floor and increase the number of units to 32. Maria Pizzi died in February of 1971, and on July 8, 1971, Salvatore Pizzi transferred the property to himself, his son, Michael Pizzi, and his daughter, Angela (Pizzi) Coblents, as trustees of the Pizzi Family Trust. Salvatore Pizzi died in May of 1978. On July 27, 1981, 259 Beacon was purchased from the Pizzi Family Trust by Rupert R. Gildenhuys, trustee of the Ross Trust. In April of 1982, he acquired 261 Beacon as trustee of the Gildenhuys Trust. 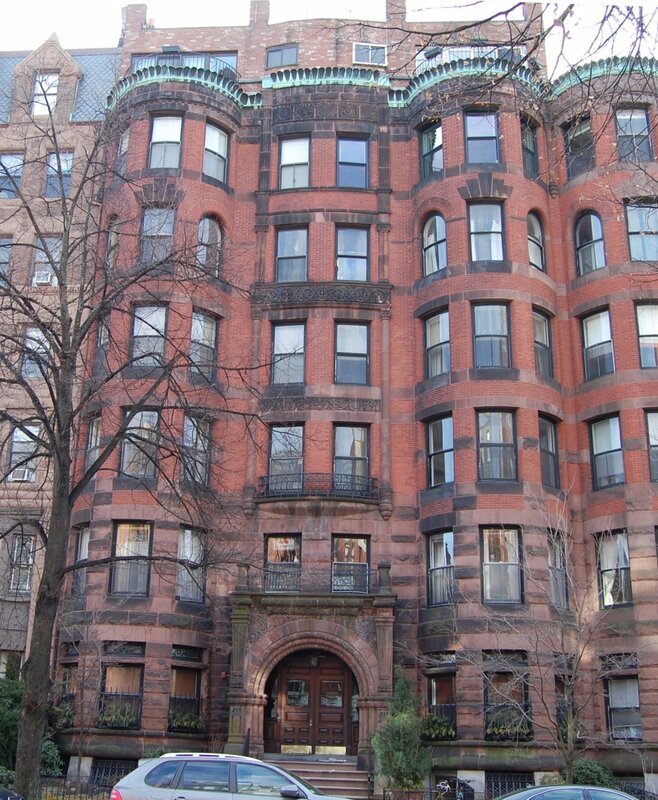 On July 27, 1984, he converted 259 Beacon into 32 condominium units, the 259 Beacon Street Condominium.